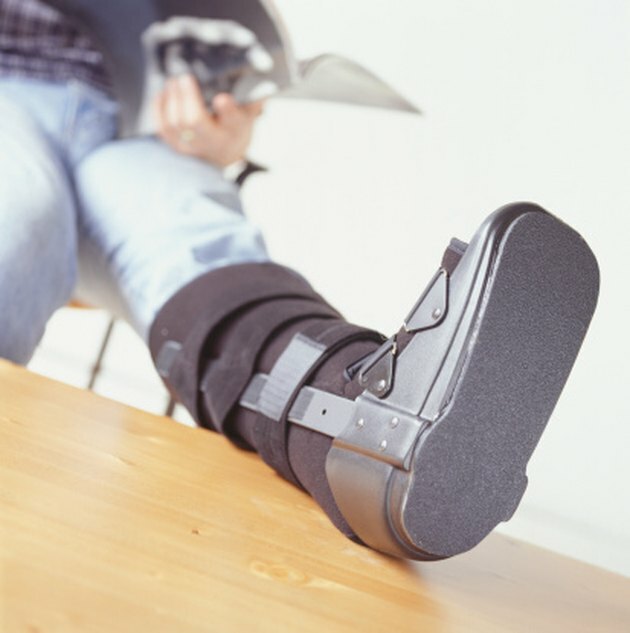 A broken leg can keep you off your feet for a period of six to eight weeks or longer. During this time you will likely have a cast on your leg and be required to use crutches or another form of walking aid. Being this sedentary can make losing weight a challenge. But rest assured, there are actions you can take to lose weight with a broken leg. Talk to your doctor. Express concerns about your weight. Your doctor can help determine a healthy weight for your body and give you advice on measures you can take to begin a weight loss program even with a broken leg. Eat a healthy, well-balanced diet. Fruits, vegetables, low-fat dairy, whole grains and lean meats should be an essential part of your diet. Eat five small meals per day. With a lot of downtime as you recover, eating multiple small meals per day can help cut down on your urge to snack between meals. Watch your liquid intake. Avoid drinks that are high in sugar and calorie content -- including pop, sports drinks and alcohol. Drink plenty of water, low-fat milk and drinks that are low in calorie content. Go for a walk on your crutches. The simple act of walking with crutches can be an effective form of cardiovascular exercise. Have a friend take you to a mall -- or other wide-open space. Avoid outdoor places with uneven ground. Walking on crutches can also help strengthen your upper body. Engage in upper body resistance training. Even with a broken leg, you can complete resistance training. Building muscle will help you burn calories and lose weight. Perform all resistance training exercises while seated. You can complete triceps and bicep curls and extensions. Complete each exercise in one set of 10 repetitions for each arm. Upper body training should be done two to three times per week. Give yourself a day off in between training sessions to allow your muscles to recover. To lose weight, do as much as you can for yourself. Perform as many daily tasks on your own as you can. For example, if you want a bottle of water, get up and get it yourself instead of asking a friend or family member for help.